As is mentioned elsewhere on this site, capturing moments that matter on a wedding day is our top priority. 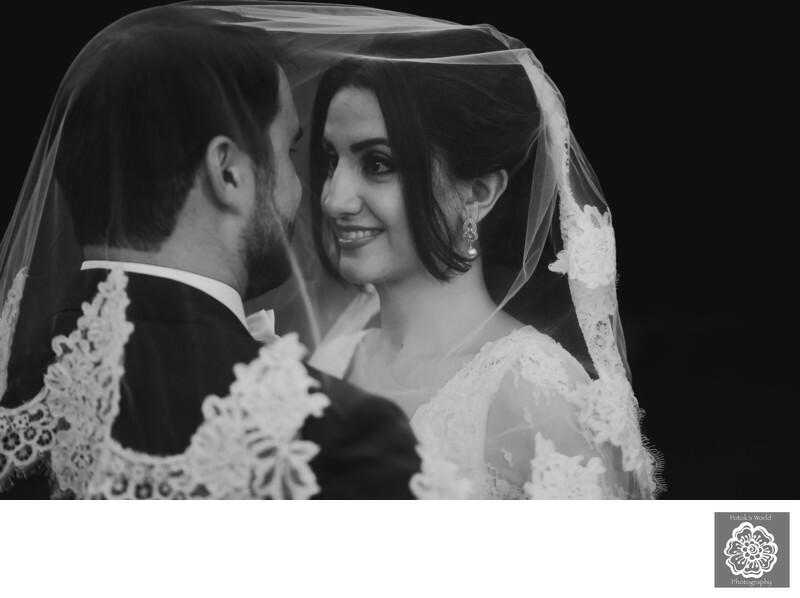 We pride ourselves in our ability to give Washington brides and grooms a photographic record of their marriage celebrations. As DC wedding photographers, we want to preserve every smile, every laugh and every tear forever. Capturing moments on film has become our photographic style. It is an approach to wedding photography that we believe in with all our hearts. Another important part of our style of wedding photography is intimacy. Washington, DC, weddings are almost always public celebrations. They are not generally open to the public, of course. But a couple’s nuptials are a public proclamation of their commitment to one another. A bride and groom put their love on display and invite their friends and family to witness it. That is generally an essential part of the process of getting married. Saying, "I do," in front of those closest to the couple makes the commitment more binding and eternal. At heart, however, a marriage is a very private thing. It is between the two people exchanging their vows at the altar. Yes, the families of the bride and groom will play a large role in their post-wedding life. But at the end of the day, the strongest bond will be the one between the newlyweds. That aspect of a marriage is something that we try to highlight with our Washington, DC, wedding photography. We want at least some of the pictures that we take to have a sense of intimacy. The couple should appear to be the only two people on the face of the earth. This is not the right approach for all of the images we create, of course. Many shots need to be wider and more expansive. They need to show the full scene around the newlyweds. But again, some portion of the photographs should focus on just the new husband and wife. We can take (and have taken) these kinds of shots at any point during a DC marriage celebration. With creative angles and long-focal-length lenses, we can easily isolate the couple in the frame. The time that really lends itself to intimacy, however, is the couples portraits. The newlyweds are typically alone during that period, so the effect is already halfway achieved. We can even do wider-angle shots in which the couple is by themselves and that feel intimate. Even though Washington-based newlyweds are typically alone for their portraiture, we sometimes still add touches that increase the intimacy. For example, we might take the photographs through tree branches or something else that obscures part of the frame. This is a great way of drawing the eye to the subjects of the image. It also makes it seem like the Washington, DC, wedding photographer has stumbled on (and taken pictures of) a private moment. 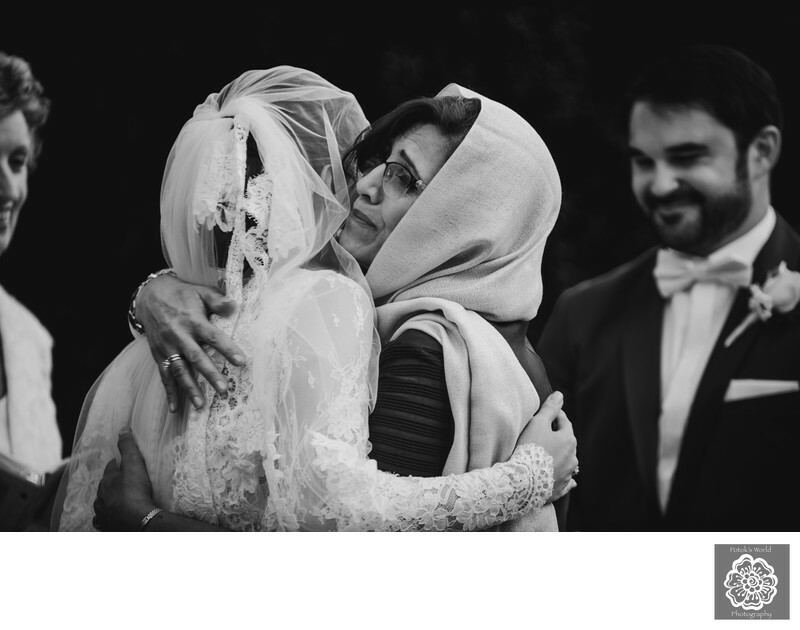 Another way to encourage intimacy is to ask the bride to pull her veil up over her and her new spouse’s heads. This technique is subtle but quite effective. It isolates the newlyweds in the frame by separating them from their wedding venue’s surroundings. More importantly, it gives the new husband and wife the sense that they are in private. Even though they are visible through the mesh of the bridal veil, they are separated from the rest of the world. That gives them a little freedom to relax and interact more naturally. We employed this technique when photographing this bride and groom at Rust Manor House in suburban Washington, DC. Located in a state park just outside Leesburg, Virginia, this historic site is a frequent host to marriage celebrations. Rust Manor House is a beautiful spot for an outdoor wedding ceremony not far from downtown DC. The wedding venue’s garden is ideal for stunning couples portraits. It has a lovely old stone wall, a lush lawn and several huge, sprawling trees. That area is great for nature-themed portraiture, but also for very intimate shots. The garden quickly gives way to deep Northern Virginia forest, so newlyweds appear completely alone even in wider-angle images. We felt that this particular DC-based couple’s portraits needed an added layer of privacy and intimacy. They had just finished an exhausting round of formal portraiture with their large extended families. As a result, they were having a hard time relaxing and embracing the chance to have photos taken of just them. That is ultimately why we had them pose under the bride’s veil. That small bit of separation helped them feel more together, creating the necessary conditions for a memorable picture.